For those who have been observing the asphalting job by the contractors in Gettysburg the last couple of months, is it really surprising that instead of asphalting rocks and trees, they have finally reached the monuments? 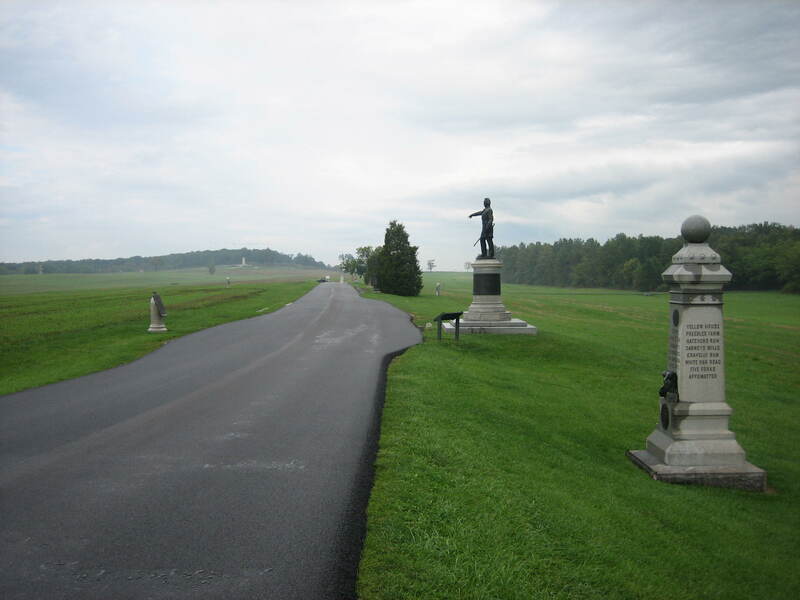 The right flank marker to the to the 147th New York Infantry regiment on the right, now has asphalt touching it. 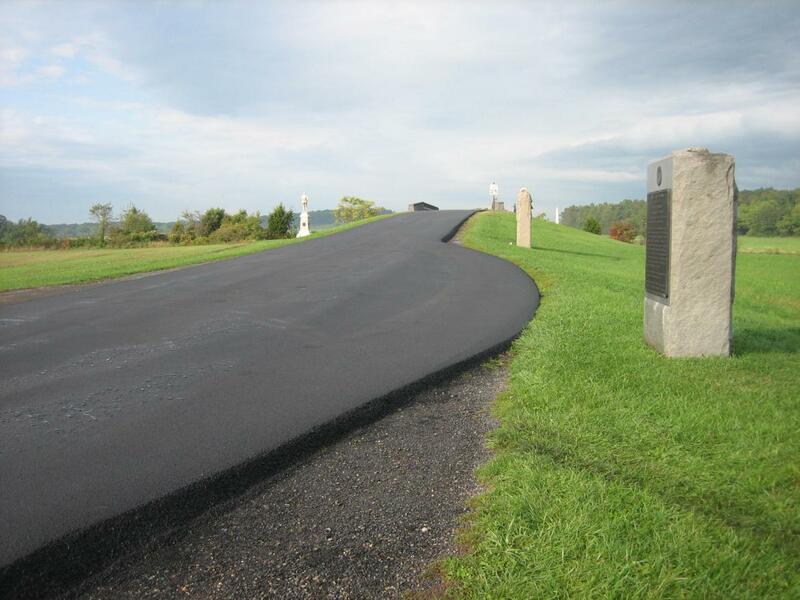 The left flank marker to the 56th Pennsylvania Infantry Regiment will soon have a dirt and gravel mixture partially covering it. This view was taken from the west facing east at approximately 5:00 PM on Tuesday, September 30, 2008. Reynolds Avenue was closed today for resurfacing. This job shouldn’t be too hard right? It’s a straight shot from the Chambersburg Pike to Buford Avenue. 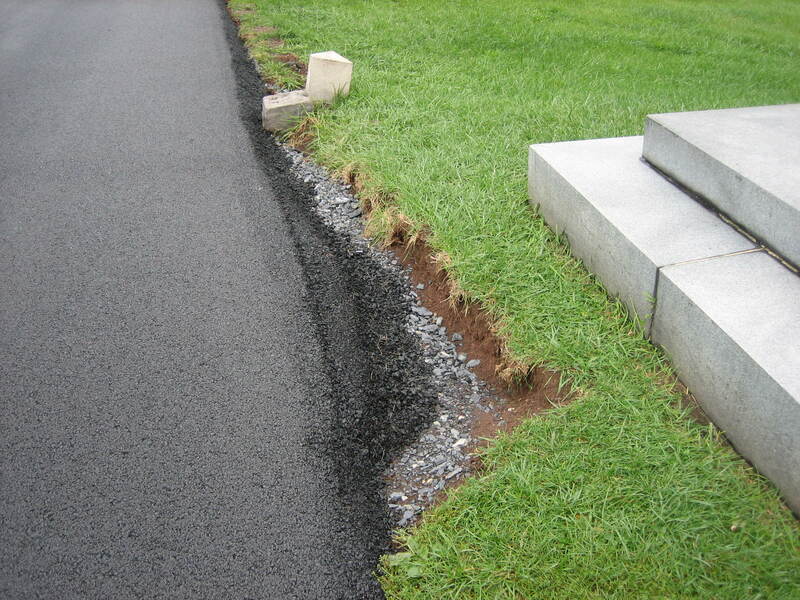 However, being the generous contractors that they are, their asphalt, instead of staying on the old roadway, spills off the sides towards items their asphalt should not be getting close to. Items like the flank markers for the 56th Pennsylvania Infantry Regiment and the 147th New York Infantry Regiment. 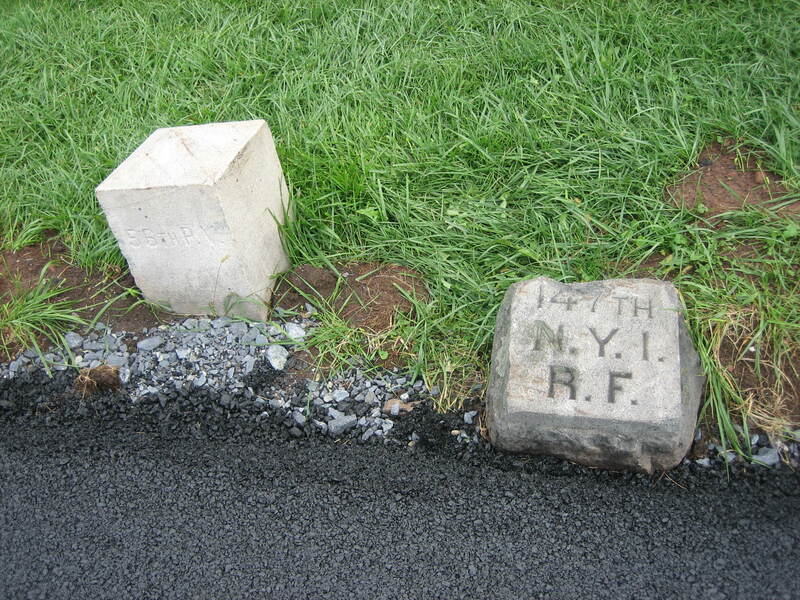 The right flank marker for the 147th New York now has asphalt touching it. 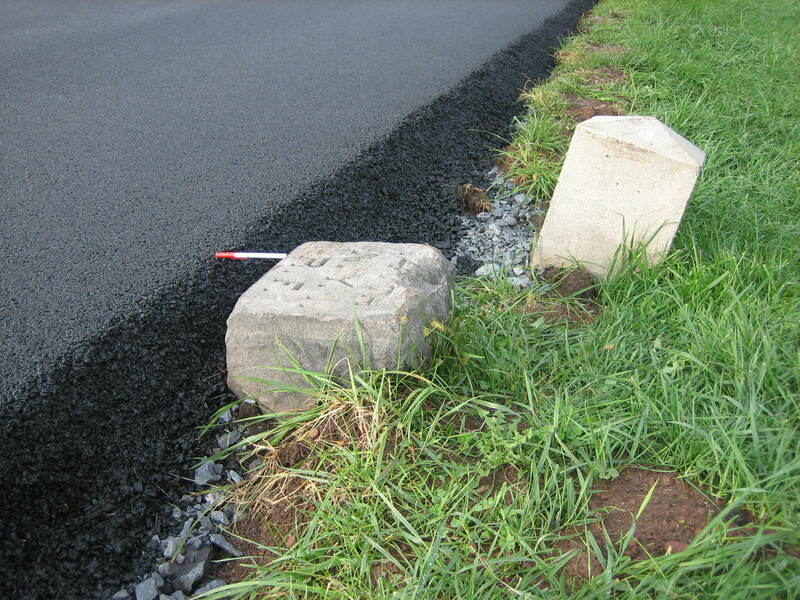 When the shoulders on the east side of Reynolds Avenue are leveled off, the dirt and gravel mix that they use will in all likelihood partially cover these markers. 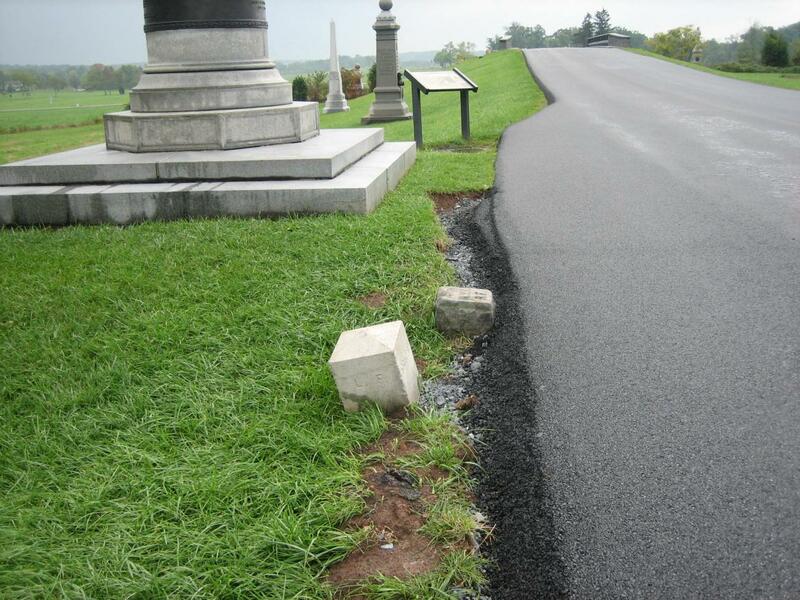 Plus, the contractor, in an effort to get closer to the markers and the Wadsworth monument, decided to do some digging. When will this end? See our post titled “Devils Den: Aftermath of the ‘Construction'” on September 11, 2008. Reynolds Avenue is closed once again this year. 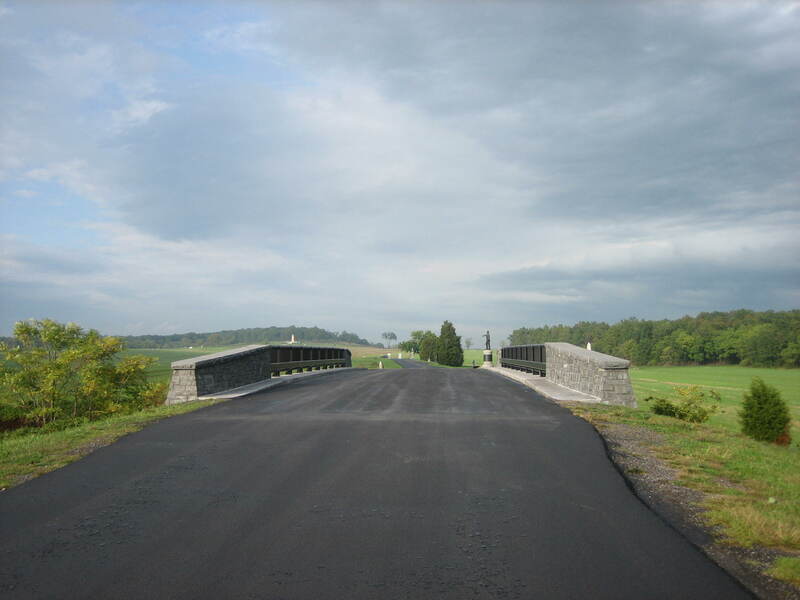 The Chambersburg Pike is running from right to left in this photograph. This view was taken from the south facing north at approximately 5:00 PM on Tuesday, September 30, 2008. 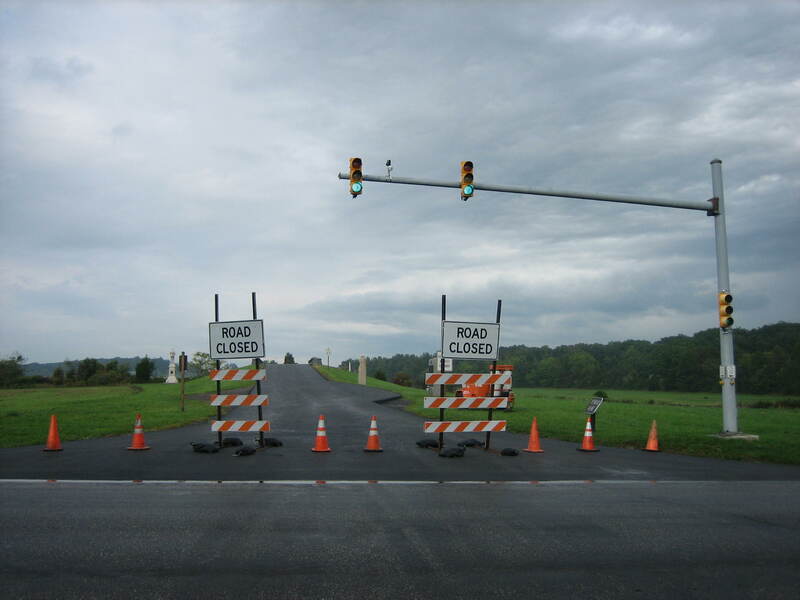 So let’s start moving from the Chambersburg Pike and travel north along Reynolds Avenue. This view was taken from the south facing north at approximately 5:00 PM on Tuesday, September 30, 2008. Here’s the pulloff on the right by the Wadsworth’s Division marker. This view was taken from the southeast facing northwest at approximately 5:00 PM on Tuesday, September 30, 2008. Here’s our nice almost one foot dropoff near the 12th Illinois Cavalry Monument. This view was taken from the southeast facing northwest at approximately 5:00 PM on Tuesday, September 30, 2008. We go over the Reynolds Avenue Bridge or Railroad Cut Bridge. This view was taken from the south facing north at approximately 5:00 PM on Tuesday, September 30, 2008. We approach the 147th New York Infantry Monument and the Wadsworth Monument on the right of Reynolds’ Avenue. 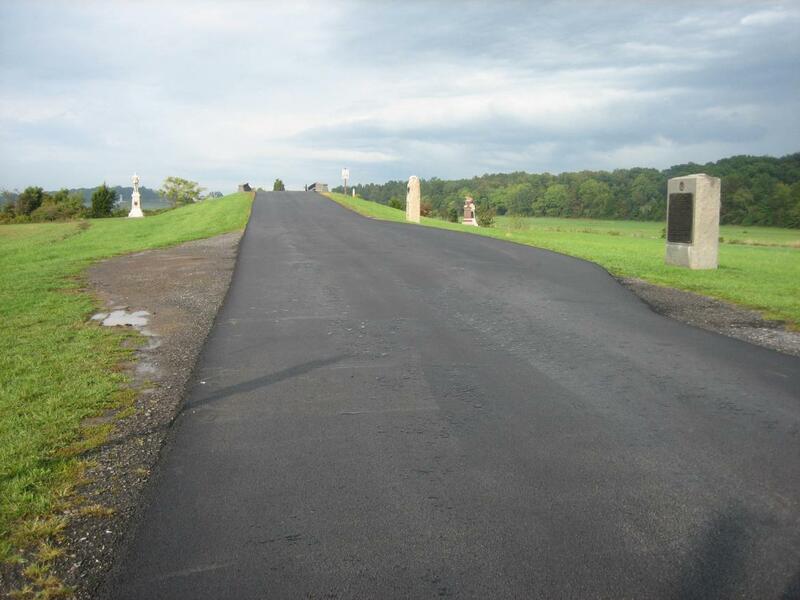 The Joseph Davis’ Brigade Marker is on the left of the road. This view was taken from the south facing north at approximately 5:00 PM on Tuesday, September 30, 2008. 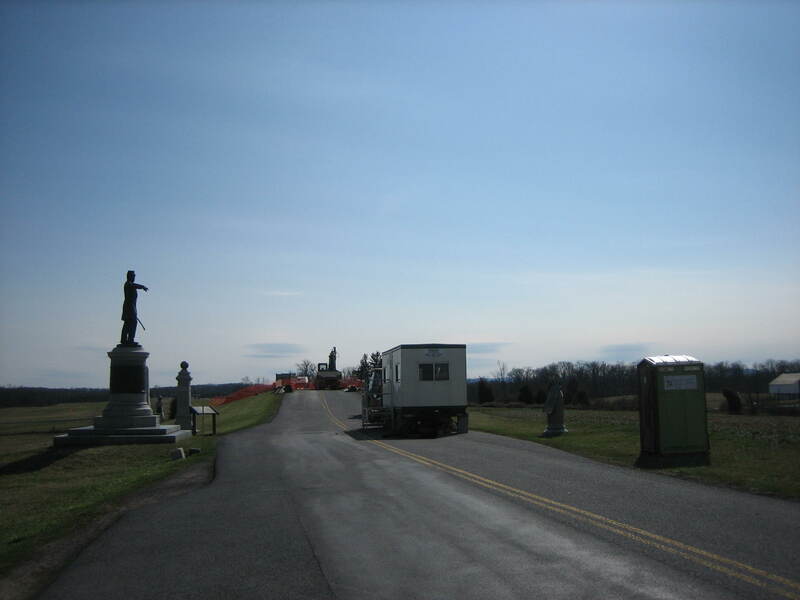 Between the Wadworth Monument and Reynolds Avenue, the contractor has decided to dig into the ground for some unknown reason, and get even closer to the Wadsworth Monument. The asphalt is touching the right flank marker of the 147th New York. This view was taken from the south facing north at approximately 5:00 PM on Tuesday, September 30, 2008. 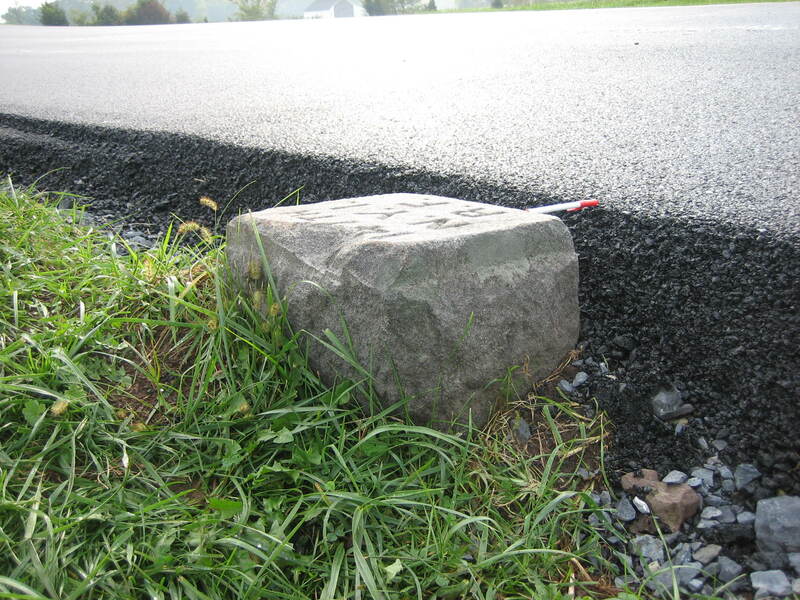 The asphalt is now as high as the 147th New York flank marker, as shown by the height of the ink pen on the top of the road and the top of the marker. 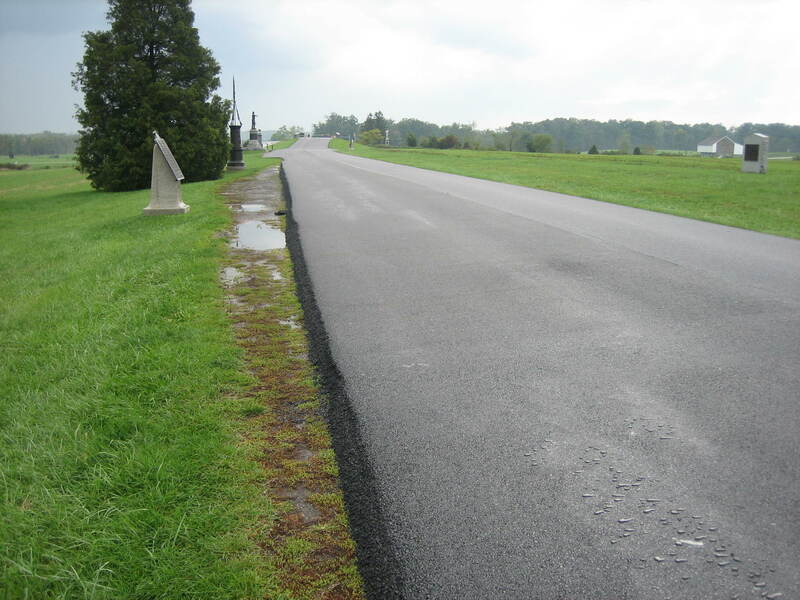 To even out the road shoulders, the contractor has been using a mix of dirt and gravel. It usually extends two to three feet out from the road. This should have it cover more of the 147th New York Marker, and partially cover the lighter colored left flank marker to the 56th Pennsylvania. This view was taken from the southeast facing northwest at approximately 5:00 PM on Tuesday, September 30, 2008. 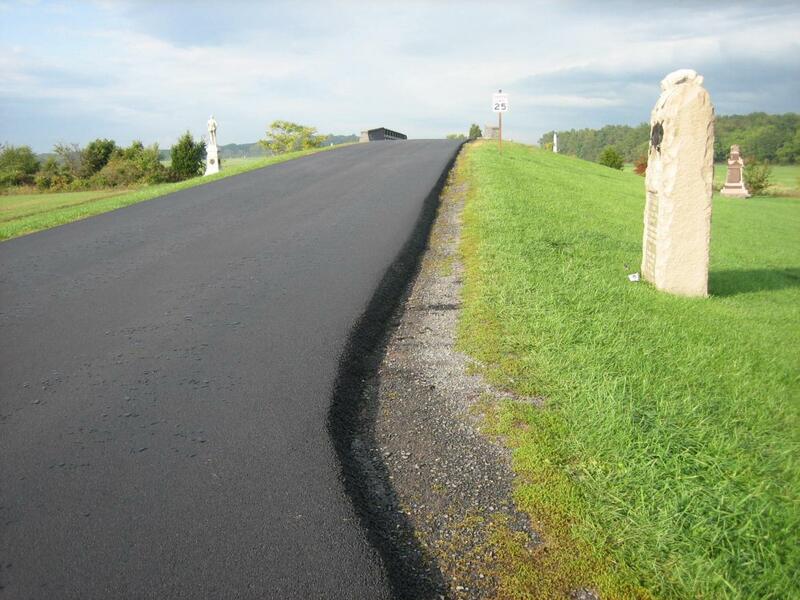 Just want to show you what the marker looked like before it is covered by the dirt and gravel mix. This view was taken from the northeast facing southwest at approximately 5:00 PM on Tuesday, September 30, 2008. 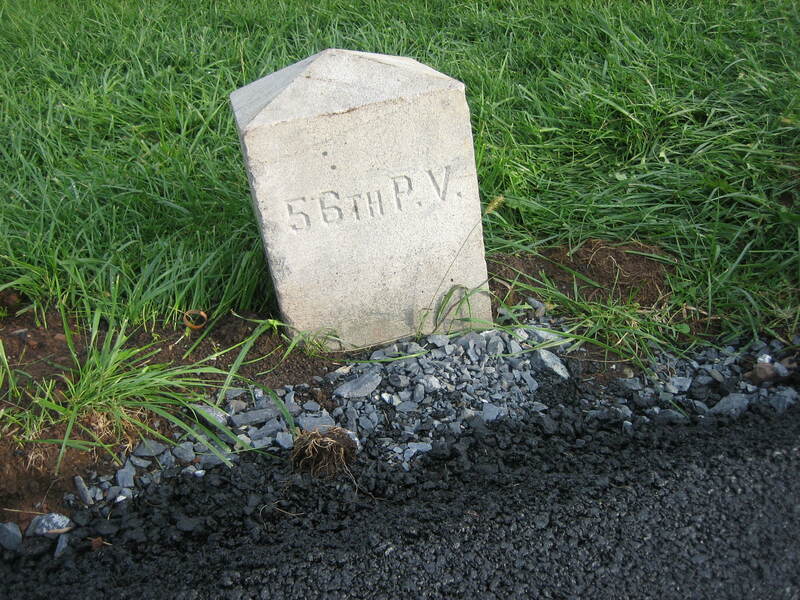 And here’s a final view of the left marker to the 56th Pennsylvania. Hopefully the letters will still be visible after the dirt and gravel mix cover it. This view was taken from the west facing east at approximately 5:00 PM on Tuesday, September 30, 2008. The road never used to be this high or this close to those markers. You may have to click on this picture to enlarge it, but one can make out these markers on the left (east) side of the road. 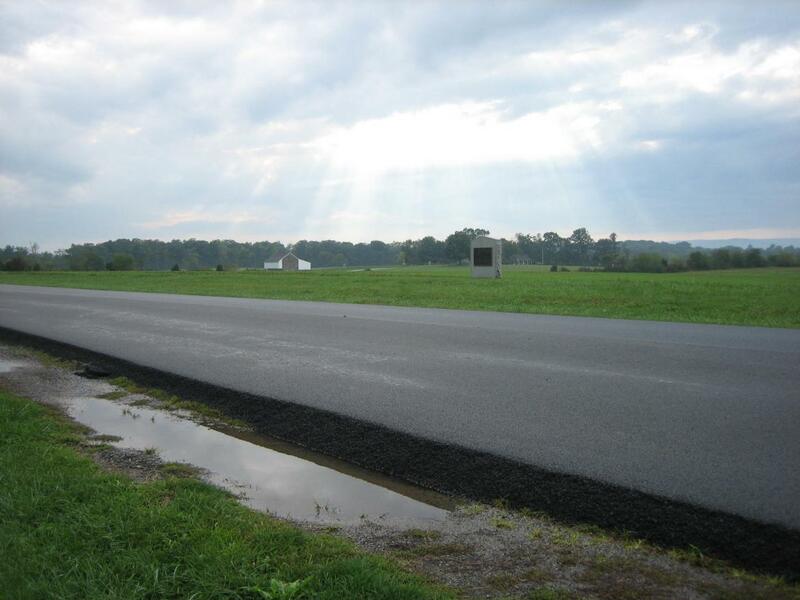 Their relation to the road is not nearly as close as it is now. This view was taken from the north facing south at approximately 4:00 PM on Friday, March 21, 2008. Here’s that same view today. This view was taken from the northeast facing southwest at approximately 5:00 PM on Tuesday, September 30, 2008. We must ask again. 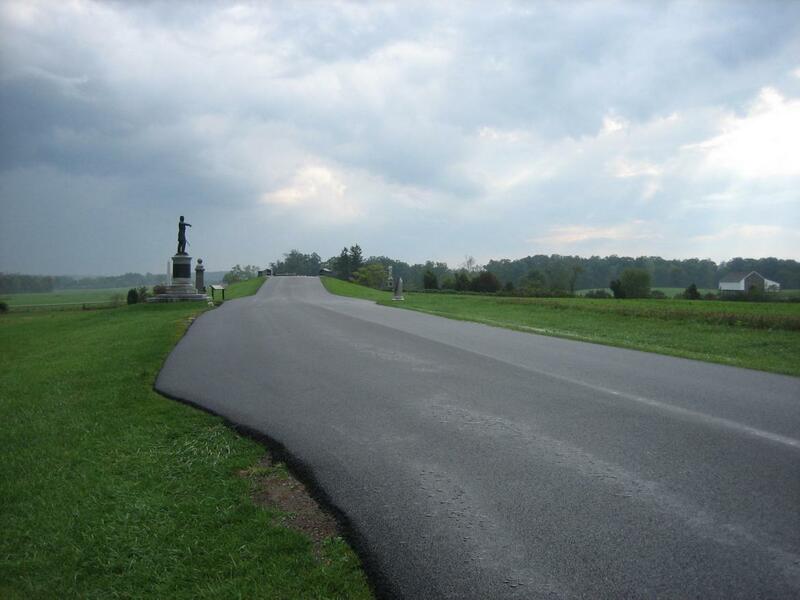 Is anyone in the National Park Service in charge of or aware of this project? Where is the monitoring? This view was taken from the north facing south at approximately 5:00 PM on Tuesday, September 30, 2008. 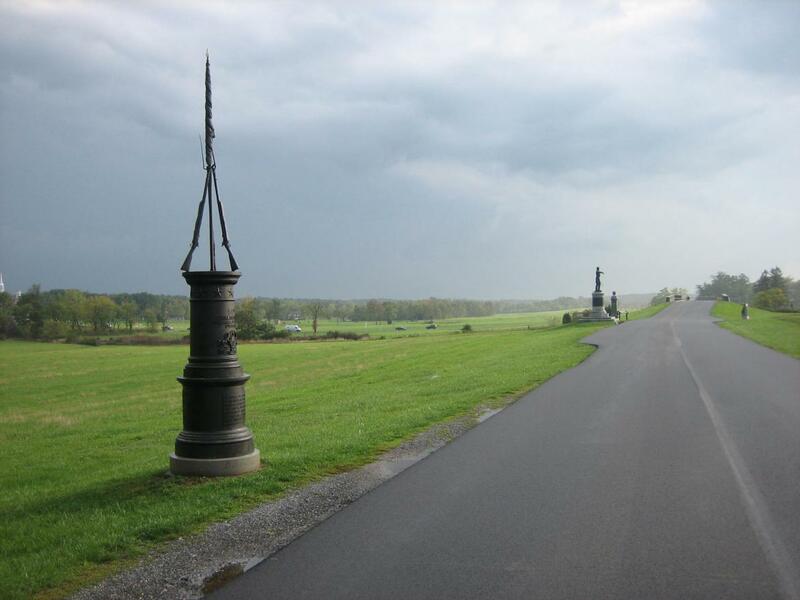 Here’s the monument to the 56th Pennsylvania and its relationship to the Wadsworth Monument. This view was taken from the northwest facing southeast at approximately 5:00 PM on Tuesday, September 30, 2008. We look forward to seeing how far the dirt and gravel mix will extend on the left (east) side of Reynolds Avenue in this area. This view was taken from the northwest facing southeast at approximately 5:00 PM on Tuesday, September 30, 2008. Again, we have an approximately one foot drop off here. The McPherson Barn is in the background. This view was taken from the northeast facing southwest at approximately 5:00 PM on Tuesday, September 30, 2008.